Marcus Maecilius Flavius Eparchius Avitus was descended from a noble family in Gaul. Avitus was a popular career man in Gaul who had risen to the position of Praetorian Prefect in the Province. He was a close friend of the Visogothic King Theodoric I. In 437 AD, Avitus had actually fought against the Goths. He personally persuaded Theodoric I to accept a peace treaty. Apparently, his friendship began at that point in time. In 451 AD, this friendship paid-off when Avitus again persuaded King Theodoric I to join with the Romans againstAttila the Hun. While Attila was defeated, aided by the Goths, Theodoric I was killed in the battle. He was succeeded by his son Theodoric II, who was a very close friend of Avitus. Following the murder of Petronius Maximus on his attempted flight from Rome in front of the pending invasion of the Vandals in 455 AD, Theodoric II approached Avitus with the idea that he, as Prefect, could legally claim the throne of the West given the absence of a blood heir. Avitus agreed and he was proclaimed Emperor by the Goths on July 9th or 10th, 455 AD and invested several weeks later at Arles. Avitus set out for Italy and upon reaching Rome he took the consulship in 456 AD. The Emperor of the East, Marcian accepted Avitus as the legal ruler of the West, but the Senate of Rome was far from agreeable. Avitus then relied upon the Goth Ricimer to defend Italy and drive off the Vandals from North Africa. For his victory, the Senate voted a triumph but restricted it personally to Ricimer making its disapproval of Avitus quite blatant. Avitus’ position in Rome was becoming questionable. The bad will felt by the people continued to stem from Avitus’ reliance upon Gaulish and Gothic troops to hold his power. Avitus tried to win the approval of the Senate and the people of Rome by dismissing his foreign troops. However, in order to do so, Avitus began stripping Rome of its copper statues in order to pay off the troops. This final outrage led to an open public revolt from which Avitus fled. In the vacuum, the people welcomed the Goth Ricimer and his imperial puppet Majorian. 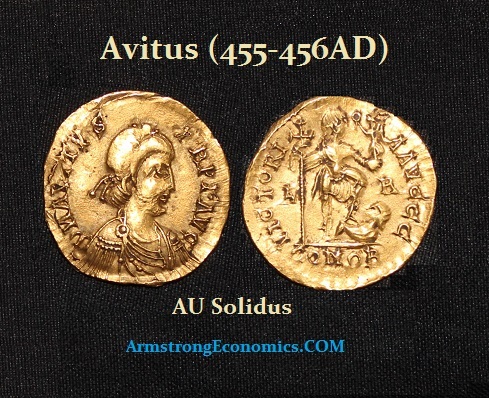 Avitus finally abdicated in September of 456 AD. He reportedly sought to become a bishop perhaps hoping to save his life. Despite being consecrated a bishop in late October, the Senate still hated Avitus and sentenced him to death. While on his way back to Gaul, Avitus died rather suspiciously. Coinage of this Emperor is quite rare given his very short reign between July and September of 456 AD.